The toddler stage is a whirlwind of milestones and challenges. Your little one is now starting to develop their own unique personality and they often aren’t afraid to show it! It’s a vital time in your child’s life, as it’s where they start to learn more about the world around them and they develop essential skills that will aid in their development. One of the most influential skills they’re going to develop at this time is how to socialize with others. Not only are they going to test your authoritative boundaries, but they’re also going to start interacting more with their peers. This isn’t always a straightforward process. Just like adults, some toddlers are much more sociable than others. Not every child is going to develop social skills at the same speed and they may need a little encouragement. If your little one is struggling or you’re concerned about their socializing skills, below you’ll discover some of the best tips that can help. Perhaps the worst thing you can do if your toddler is shying away from social interactions is to push them into frequent, large social settings. Not only won’t this help their socialization skills, but it’s likely to make them worse. Taking baby steps and introducing them into new social situations gradually will be much easier for them to handle. Don’t just turn up to a toddler play group for example, and expect your little one to dive straight in. Instead, start with smaller play dates and attend small local groups. Play dates at home are especially helpful as you’ll still be around if needed and your little one will be in a familiar setting. While it’s true toddlers love nothing more than to take a hands-on approach to most things, observation is just as important in terms of their development. Before encouraging your toddler to partake in social situations, it’s a great tip to simply let them observe other children at play. By watching other toddlers interacting with each other, your child will see for themselves exactly what they can expect. You can do this practically anywhere you go such as the park or even just on your way to the local grocery store. Your toddler looks to you for guidance on how to behave. Therefore, if they never witness you greeting complete strangers, why should they be expected to do the same? Making an effort and talking to people you don’t know, shows your little one it’s perfectly normal to chat to other children they have never met before. It can also teach them how to approach someone new. Your toddler is much more likely to engage in social situations if it’s perceived as a fun, enjoyable activity. In the early toddler years, you can start this by creating a “greeting game”. Following on from the tip above, you can say to your toddler “when we leave home, we’re going to greet five different people”, then when you get back you can talk about the greetings and individual encounters. During the later toddler years, you can expand a little and use role playing as a way to build up their social skills. It’s a great idea to use teddies or figures to represent other children. Then practice basic socialization skills such as greetings and behaviors. If you’re worried about your toddler’s social skills, it’s common to want to step in and take a more forceful approach. We’re often taught as adults, to force ourselves into situations we feel uncomfortable in. They say it’s the best way to face our fears. However, your toddler doesn’t have the same emotional development skills as you do, so forcing them into doing something they don’t feel comfortable doing is only going to make matters worse. If you make a big deal out of socializing with others, they will start to dread the experience and try to avoid it. So, as tempting as it might be, refrain from pushing them too hard to participate. Toddlers don’t have the longest attention spans and they tend to get bored quite quickly. You already know that when your toddler gets bored, they get disruptive! What starts out as a great, positive socialization session, could quickly turn into a nightmare one if it runs over a little too long. So, pay attention to your toddler and know when they’ve had enough. Keeping the sessions short ensures your little one only remembers positive memories of the play dates. This means they’ll start to look forward to the next one! There’s bound to be at least one occasion your toddler does something they shouldn’t. For example, many toddlers go through a biting and hitting phase. They get frustrated quickly, so when they’re playing with another toddler, it may not be long before pushing, hitting or shouting ensues. So how do you handle this? Quickly, firmly and calmly, without giving them a lecture. It’s really helpful to praise your toddler when they do something right. For example, whenever they do something polite or thoughtful, praise them. This teaches them that their social skills are valued and acting nicely to others results in praise. 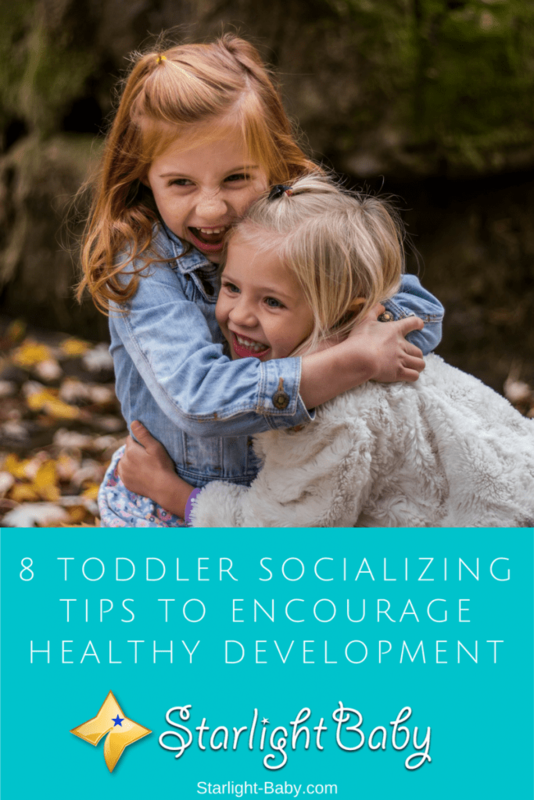 It’s not always easy to know how to handle social situations with your toddler, but the above tips will definitely help you to work on and improve their social skills. Above all else it’s important to be patient and remember that each child develops at a slightly different pace. Did you have issues when trying to socialize your little one? Let us know how you handled it and any useful tips you might have that we haven’t covered! Taking care of toodlers is never easy, it needs more extra patience. This is the time that they start to go to Nursery as their first step to formal school and the time more meeting and greeting of other people but mostly same of thier age. Make socializing in game, I think they would love this but incase that your child is not yet ready, give them time. Kids have different rage of development, some are early some are late but we can correct this development by portraying a role to them. They are good in imitation. They can act the way the people around them usually thier parents. This is such good topic to help those parents having a social isuue of their kids. You’re right, sweetpot81. Kids differ in their development. Each at his/her own time. So parents should be able to gauge if their child is already ready to socialize; if not, they should slowly coach him/her on how to get to know people and get along. Some are just too shy to make friends or interact with anyone except their family members. This should be addressed and hopefully, the child learns to socialize eventually. I like how you have explained your points and I know this methods will work. They are simple and I know with patience, any parent can get their toddler to be social. I am not a social person myself and it’s really a struggle to communicate with strangers. I don’t know if it’s too late for me but I’m sure parents need to practice all the 8 points you mentioned so their toddler can grow to be a social confident person. Indeed, a parent’s support for his/her child is always a vital step in a child’s development. They should not be forced to do things they’re not comfortable doing. Allowing them to observe and gradually warm up to other kids will be a good start. I have experienced this with my youngest child. She was not sociable at all when she was younger, and would often not respond to someone she has met for the first time. I gradually took her out to kiddie parties to meet other kids. Eventually, she learned to make friends and to play with other kids. There are still moments when she wouldn’t but I’m hoping she’ll eventually become very friendly. I found this article very useful and informative. As a parent of a 5 months old child, I understand I will have to tackle various issues as my child grows older. One of the issues I will have to tackle soon is helping my child socialize with his peers. I agree with all of the points mentioned here and my favorite ones are: increasing socialization gradually and keeping socialization session short. Thank you for agreeing with the points mentioned here, vinaya. I’m sure most of the tips will help you teach your child to socialize in the near future. As your child grows up, you will be able to know his personality – whether he is an introvert or extrovert. Kids do have various personalities so you’ll eventually know what your child’s personality is. You’ll then know what to do or what steps to take after you’ve analyzed his personality. If you have ever being with a child that has an introvert personality, you as a parent would do anything humanly possible to get your child not be of such character and behavior. This is where getting one’s child to get to socialize with his or fellow kids, probably through sports and exercise. This would definitely help the child to learn how to express himself or herself without feeling shy or having an inferiority complex. Getting engaged in sports is one of the best way to improve children socialization.